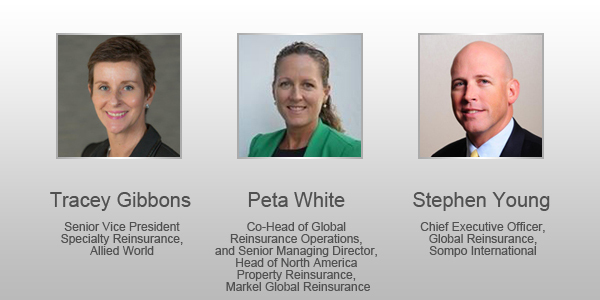 Women in Reinsurance [WiRe], the organization for professional women working in the Bermuda reinsurance sector, today announced three appointments to its board, with Tracey Gibbons, Peta White and Stephen Young being appointed. “It speaks volumes to the impact that WiRe has made on the Bermuda marketplace to date that Tracey, Peta and Stephen have so enthusiastically agreed to join our board. As we continue to develop WiRe, we look forward to the leadership and commitment of these three prominent executives,” said Kathleen Reardon, Chair of WiRe and CEO of Hamilton Re. “In order to continue advancing and promoting the development of professional women in the reinsurance industry, maintaining an inclusive approach ensures the best outcome. The collective thought leadership of the expanded board—which includes our first male Director—will be instrumental to WiRe’s continued success.